Having read most of iconic Beat Generation writer William S. Burrough's novels, I have known about the hallucinogenic drug ibogaine for a couple years now, yet I never knew it had properties that could cure drug addiction (after all, it is a psychedelic drug). Apparently, ibogaine has the organic power to instantly cure opiate addiction, as well as stop drug withdraw; the most painful and unbearable aspect when attempting to quit opiates cold turkey. Despite the fact that there has been a lot of scientific research done proving ibogaine's effectiveness in curing opium addiction, ibogaine is still illegal in the United States. In the documentary I'm Dangerous with Love (2009), filmmaker Michel Negroponte follows an ibogaine advocate named Dimitri Mugianis as he illegally helps junkies from various parts of the United States quit heroin addiction with ibogaine treatment. Director Michel Negroponte also tries ibogaine himself in an attempt to see if the hallucinogenic drug will cure his addiction to nicotine. As one would expect from a documentary about drug addiction, I'm Dangerous with Love is a dark and gritty, yet revolutionary work - documenting what could be a miracle drug for junkies; ibogaine. Even if a person has no interest in learning about ibogaine, I'm Dangerous with Love works as an excellent anti-opiate public service announcement. As you learn during the beginning of I'm Dangerous with Love, Dimitri Mugianis is a musician (vocalist for the band "Leisure Class") and ex-junkie who found a cure for his addiction via ibogaine. During his tragic drug addicted life, Dimitri lost best friends and even his girlfriend to heroin, yet none of these horrible events would effectively convince Dimitri to finally quit his opiate-addicted road to a very possible premature death. Dimitri had been addicted to heroin for 20 years, but a single dose of ibogaine cured his life-threatening vice instantly. After kicking his addiction with ibogaine, Dimitri would later dedicate his life to helping other addicts. Despite the illegality of Dimitri's underground ibogaine cure campaign, the former addict rather enjoys his work as he so earnestly expresses in I'm Dangerous with Love. 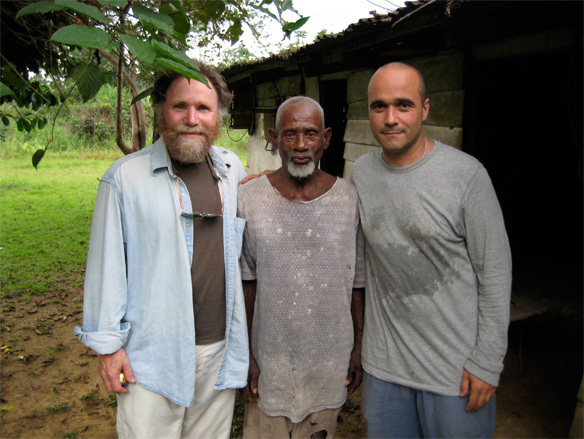 In the documentary, director Michel Negroponte documents Dimitri's administration of ibogaine on various lifelong addicts during a 3 year period. By the end of the documentary, it is revealed that the various subjects who had been administered ibogaine treatment were either completely cured of addiction or were on methadone treatment and no longer wandering the streets in search of heroin. Although I have yet to see the documentary, director Michel Negroponte previously directed Methadonia; a work documenting the substitute addiction of methadone, a synthetic-opiate drug (created in Germany for injured soldiers at the end of World War II when opiates ran out) even more addictive than heroin. After watching I'm Dangerous with Love, it is quite apparent that a single dosing of ibogaine is a much safer alternative to a lifelong addiction to methadone. 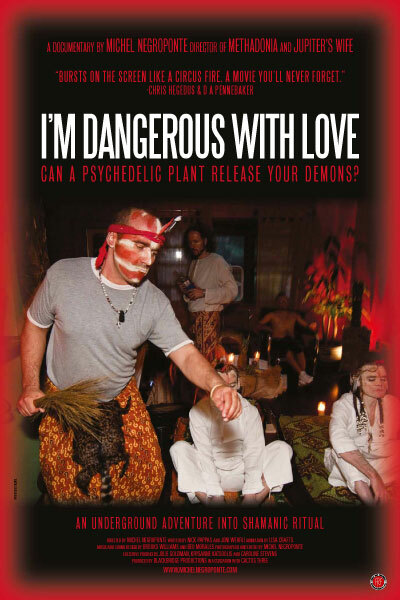 None of the participants in ibogaine treatment featured in I'm Dangerous with Love seem to have "bad trips" while high on the drug - certainly no worse than the painful withdraw they would have had quitting heroin cold turkey without the hallucinogenic drug. Towards the end of I'm Dangerous with Love, director Michel Negroponte and Dimitri travel to Western Africa to participate in an ancient Shamanic ritual using ibogaine with native tribesmen. Although this segment of the film is interesting from an anthropological perspective, I doubt it helps to further the cause of legalizing ibogaine for lawmakers. 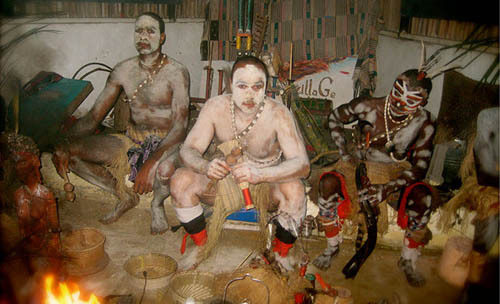 After all, the reason ibogaine is illegal is due to its hallucinogenic properties, as the trip has been described as having the ability to metaphorically "break open the head." When Negroponte tries ibogaine, he has various flashbacks - including being in his mother's womb. Apparently, scientists are currently working on creating a derivative of ibogaine the lacks the substance's hallucinogenic properties, thus making it very possible that the drug will soon be a legal alternative for kicking opiate addiction. That being said, I believe that Michel Negroponte has done a very noble act by creating I'm Dangerous with Love, as the documentary is an in-depth and easy to understand introduction to ibogaine; a wonder drug for desperate opiate addicts. Also, I would be lying if I did not admit that the documentary made me sick to my stomach. Forget William Friedkin's The Exorcist (1973), I'm Dangerous with Love is a real-life documentation of opiate-possessed individuals who have their demons organically exorcised. If you thought Danny Boyle's Scottish junky flick Trainspotting (1996) was disturbing, you have yet to see I'm Dangerous with Love. For more information on this groundbreaking documentary, check out First Run Features.